Jean-Luc Thunevin, the Bad Boy of St. Emilion has turned the lovely and formerly innocent, Murielle Andraud into a Bad Girl! It was bound to happen sooner or later. It was only a matter of time. Think about it. What good is a Bad Boy without a Bad Girl? That’s how the St. Emilion, Bordeaux wine making couple, Jean-Luc and Murielle see it. We agree, especially with Bad Girl Cremant de Bordeaux. 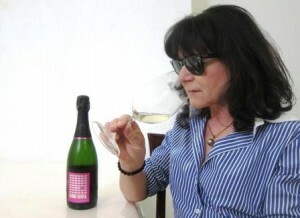 Murielle Andraud, who has taken over Bordeaux wine making responsibilities for Valandraud and Ets Thunevin Bad Boy, is in charge of producing the first, Cremant de Bordeaux wine from Jean Luc and Murielle. The sparkling wine, Bad Girl Cremant de Bordeaux is produced from grapes grown in the Entre Deux Mers appellation. Several generations ago, white wines from Entre Deux Mers were highly sought after. They were considered quality wines. Wines from the appellation of Cremant de Bordeaux are the only wines in Bordeaux that are allowed to be be produced as sparkling wine. The Cremant de Bordeaux appellation was created in 1990, when Valandraud was still a dream for Jean Luc Thunevin and Murielle Andraud. Bad Girl Cremant de Bordeaux is produced from a unique blend of; 70% Semillon, 20% Cabernet Franc and 10 % Muscadelle. Before deciding on the final blend for Bad Girl Cremant de Bordeaux, Murielle and Jean-Luc tasted a myriad of different combinations to find the style offering the combination of crisp and fresh flavors they were seeking. To produce Bad Girl Cremant de Bordeaux, the juice is clarified and filtered to obtain the must. 150 kilograms of grapes yields 100 liters of juice. The wine is fermented at 18 degrees Celsius following a “debourbage”, (this allows the must from white grapes to fall to the bottom of the barrel before racking) with cold action. The wine did not undergo malolactic fermentation. There is no fining, or sterile filtration used as well. Bad Girl Cremant de Bordeaux made its debut vintage from grapes harvested in 2008. 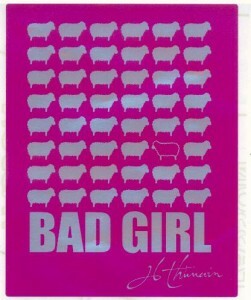 Bad Girl was first bottled in April 2009. Since that date, it was aged on its lees in bottle, at a constant 12 degrees Celsius. Nine months later, December 19, 2010, the wine was disgorged and the liqueur d’expedition was added. That is the same process allowing the wine to develop its bubbles that is used in making Champagne. Close to 800 cases were produced. Bad Girl Cremant de Bordeaux will retail for under $20. The name Bad Girl is causing problems in America. They did not receive approval for the wine to use that name in America. They will need to come up with a different name before being cleared to sell the wine in the USA. Bad Girl is best on release or within a year or two Chateau Alcee is better with at least 2-3 years of aging in good vintages. Bad Girl is best served at 15.5 degrees Celsius, 60 degrees Fahrenheit, or even colder, if you like it that way. The cool, almost cellar temperature gives the wine more freshness and lift. 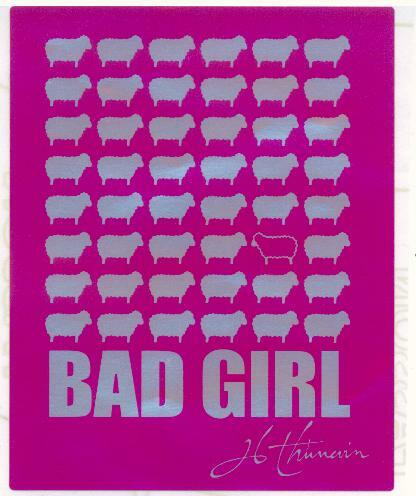 Bad Girl is best paired with all types of with all types of seafood, shellfish, sushi, sashimi, veal, pork, roast chicken, vegetables, eggs, and cheese, Asian dishes, hearty fish courses like tuna, mushrooms and pasta.